I likely should preface this article by saying that I am somewhat of a natural born worrier, but even putting this known personality trait aside, I think the recent news stories of kids being left alone in a house with a babysitter via Skype is pretty alarming stuff. It's difficult to find the actual truth in the stories that have recently surfaced, with some reports stating a child as young as 4 was left alone with a grandparent babysitting via Skype, and other reports mentioning 7 year olds being left alone with Skype sitters. The truth that is coming out, however, is that young children are being left alone, and that a Skype sitter is the only supervision that they are being left with. Provide emergency attention should a situation warrant it. Cannot prevent an accident happening even if they can see it on screen. Provide first aid treatment, should a choking incident occur. Get refreshments for the child that is being looked after. Settle a child for their nap or bedtime sleep. Stop a child from opening a door, getting outside or getting into potentially hazardous situations. What if there is a power cut, or worse a fire? The overactive worrier in me can likely think of many much worse situations, but that's enough food for thought for now. The law in Australia is a little hazy on this topic, as there is no actual clarity on what age a child can or can't be left on their own. However, what the law does state is that parents are responsible to make 'reasonable' decisions about their child's safety and it is their responsibility to look after their children with this in mind. Parents are expected to ensure children are fed, clothed, have a place to live and moreover that they are kept safe and have suitable supervision. Based on these assumptions, I'd be hedging my bets that a Skype sitter might not pass the test as the provision of suitable supervision particularly in younger children. So for my part, even though I'd like more nights out with my husband, even though it might be nice to get to the gym a bit more often, I'll be waiting on a real life human baby sitter to help me out, and will save the fun of Skype time for when I am present and accounted for. At least until the kids are old enough to fend for themselves. 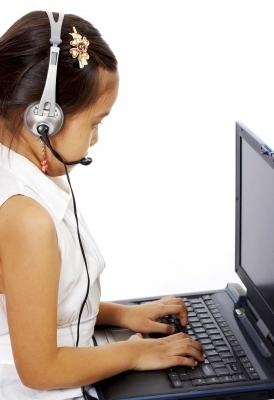 Would you leave your kids with a virtual sitter?